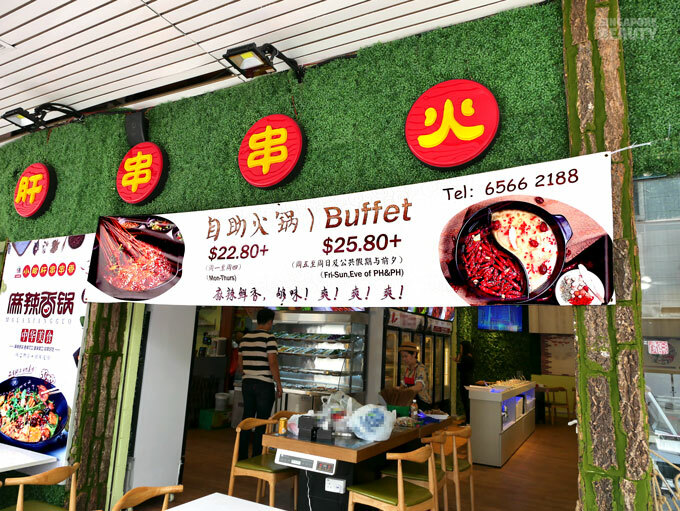 Unlimited lok lok, meats, surimi, greens and seafood all-you-can-eat buffet at only $22.80+ all days includes PH too (quote SingaporeBeauty) with unlimited dine-in time* at Xiao Jun Gan Chuan Chuan Xiang 钢管厂小郡肝串串香五味缘 located conveniently at Bugis. 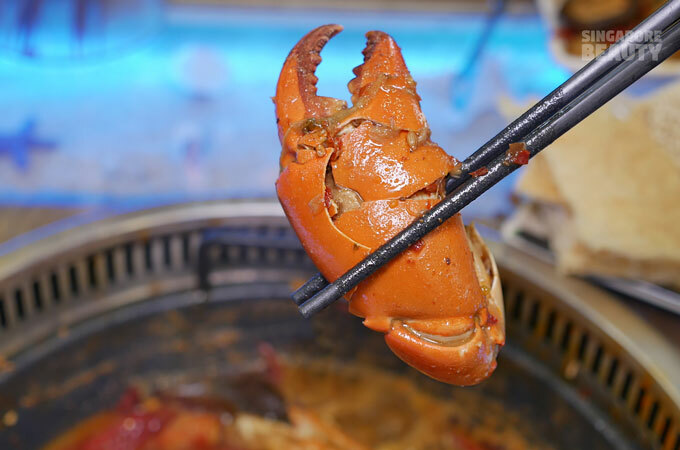 Look at these meaty mud crab claws! 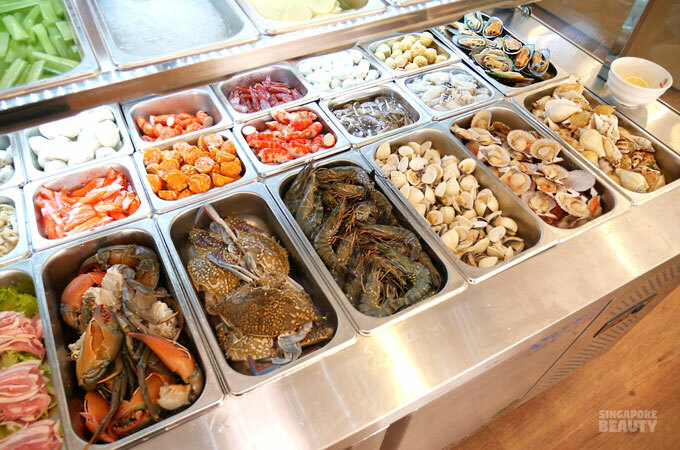 Help yourselves to unlimited seafood (included in the buffet) at the chilled display cabinet. 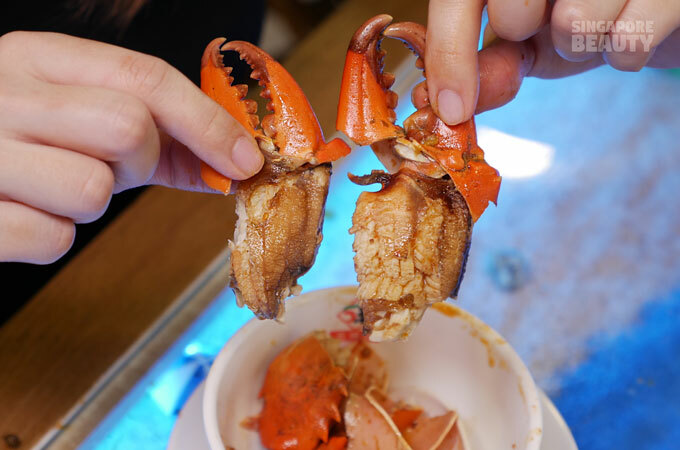 The seafood variety available are cuttlefish, baby octopus, mud crabs, flower crabs, mussels, squid rings, mock scampi tails, mock snow crab legs tiger prawns, white Venus clams, gong gong, half shell scallops and many more. 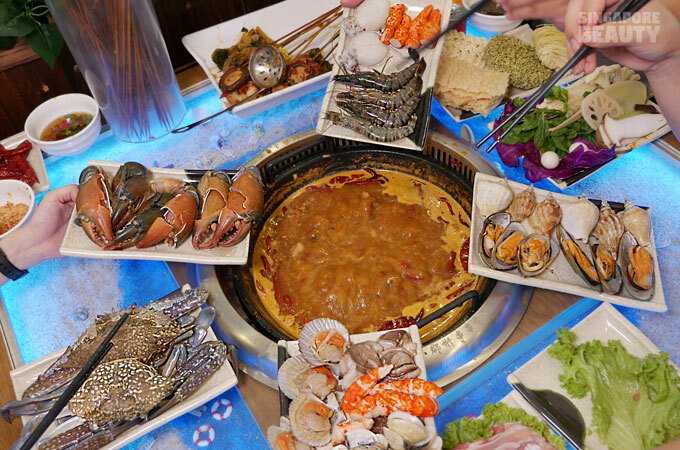 If you are a fan of mala seafood hotpot, the mala soup base here will certainty delight your taste buds. 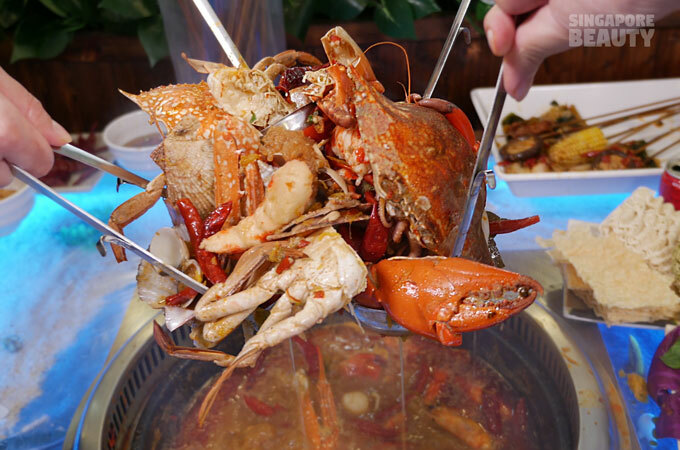 Cook these seafood quickly in the hot bubbly pot of mala goodness. The soup thickens and becomes extremely flavourful with the briny flavours of seafood. 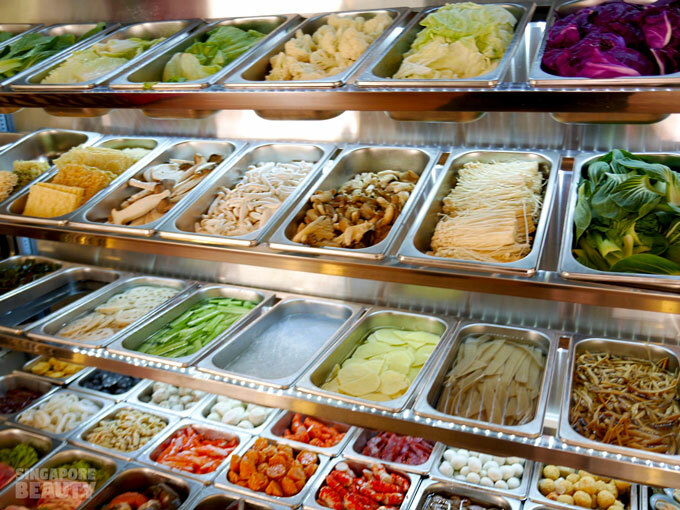 The soup base is included in the Xiao Jun Gan buffet and no extra charge is needed. 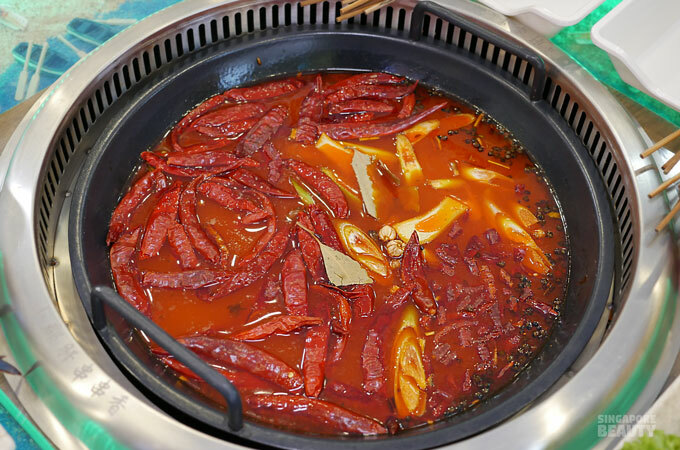 The signature soup base is the Sichuan special mala pot. 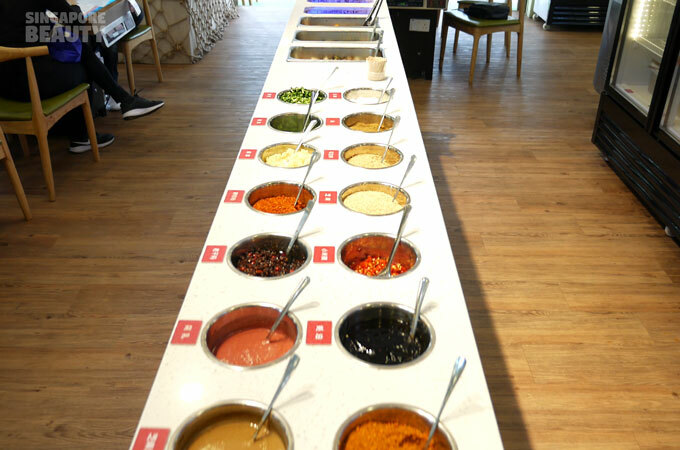 The mala soup base is made with authentic mala ingredient air-freighted from Chengdu, China. Bay leaves, cardamom, Sichuan pepper, leeks, dried chilli pepper, ginger, butter, in house broth and some secret ingredients. This soup base is unusually fragrant and has a smooth texture due to the butter base. Besides the signature soup base, try the secret recipe clear broth, tomato pot, herbal pot, shanzhen mushroom soup pot and the newly added tom yum pot. You can choose either single or duo soup. 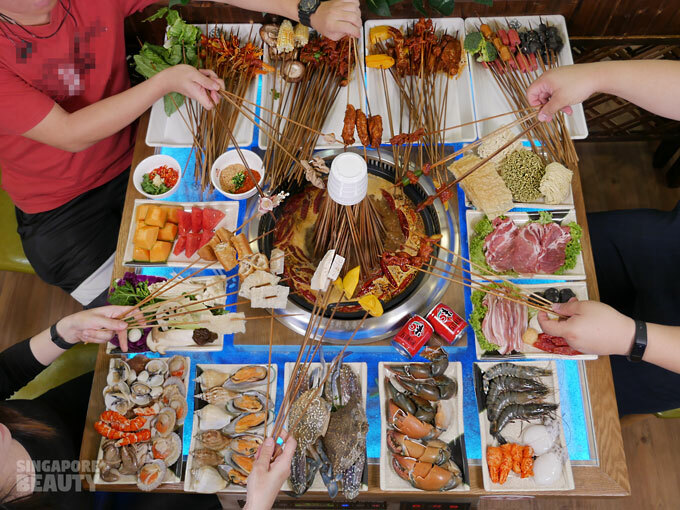 Besides unlimited seafood, there are unlimited “chuan chuan”/ lok lok/ skewers (included in the buffet) to feast upon. The variety is overwhelming in terms of quantity, quality and variety. 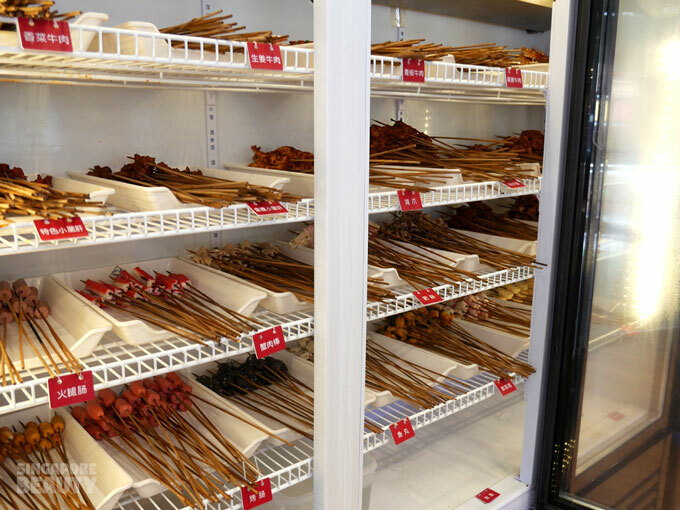 There are more than 50 types of skewers to choose from. 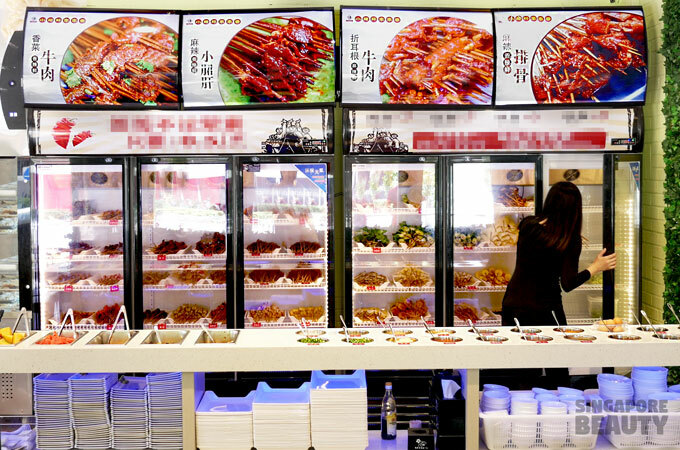 The six-door chilled cabinet is stocked to the brim with marinated meats, surimi, vegetables, signature handmade food and many more. 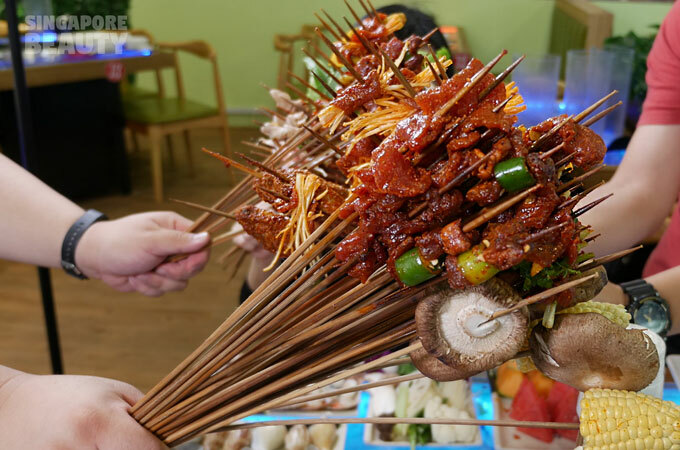 These skewers are also marinated with their secret recipe and skewered in house individually. 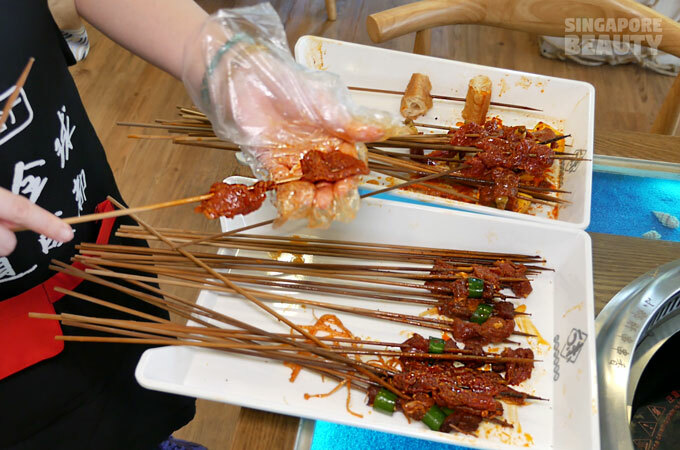 The chef mentioned that the skewered beefs uses only the prized (牛腱肉) loosely translated as the tendons meat, the part of the beef slightly below the spine area for it tender and soft texture. This is why the texture of the cooked beef remains tender and delicious. 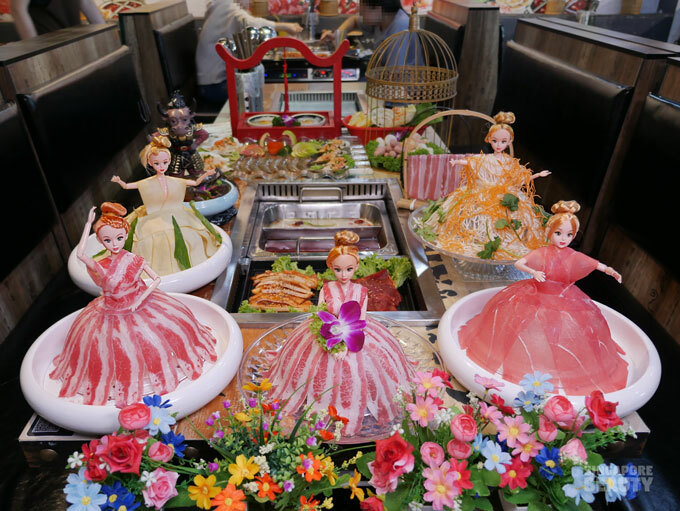 The spread of this buffet is amazing, so are the condiments and appetiser bar that is more than 4 metres long with over 20 condiments and 6 sets of tropical fruits and appetisers. Fruits and appetisers of the day are bananas, rock melon, watermelon, cheese fish cake, fungus salad and century egg with silky tofu. 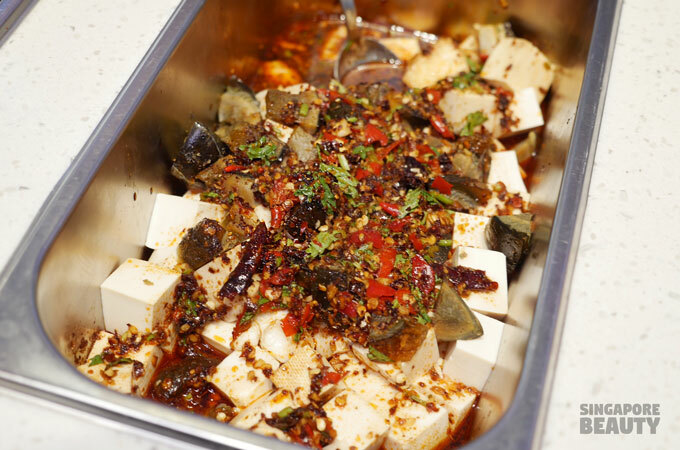 The century egg with tofu has a melt in the mouth type of century egg yolk with soft tofu braised in spicy sesame chilli oil and fragrant chopped parsley. These are included in the buffet! 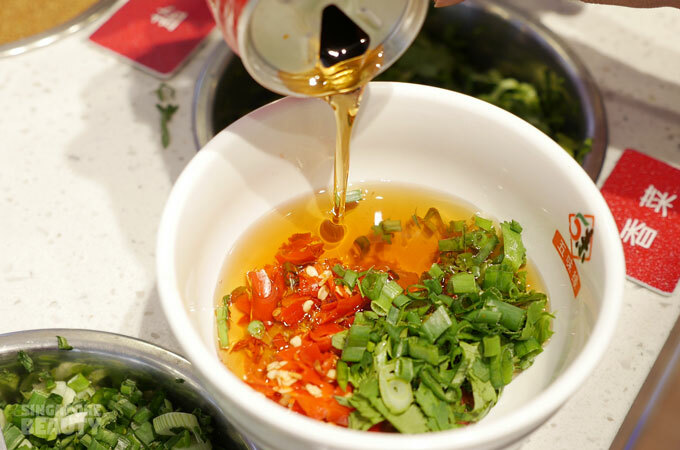 These are 3 recommended ways to mixing the perfect sauce with the condiments provided. 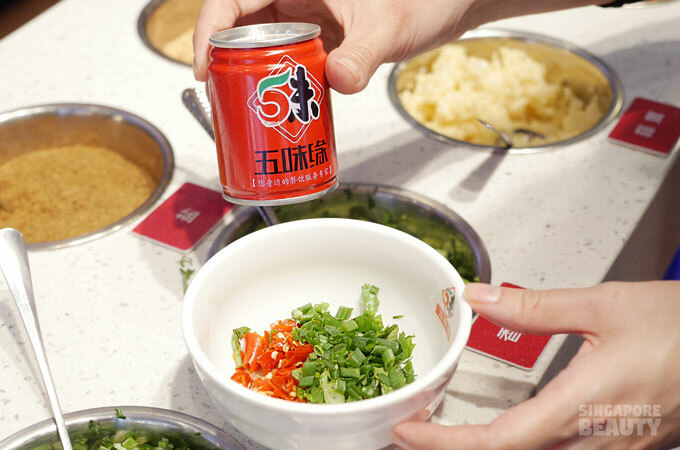 The in-house all time favourite（ 五味缘）extra virgin sesame oil is one of the recommended oil to add to the condiments (add $2+ each tin). Look at how clear and smooth the sesame oil is. Extremely fragrant. Grab a saucer, add chopped spring onion, chill, fermented bean curd sauce, peanut sauce, a dash of pure （五味缘）sesame oil and voila! 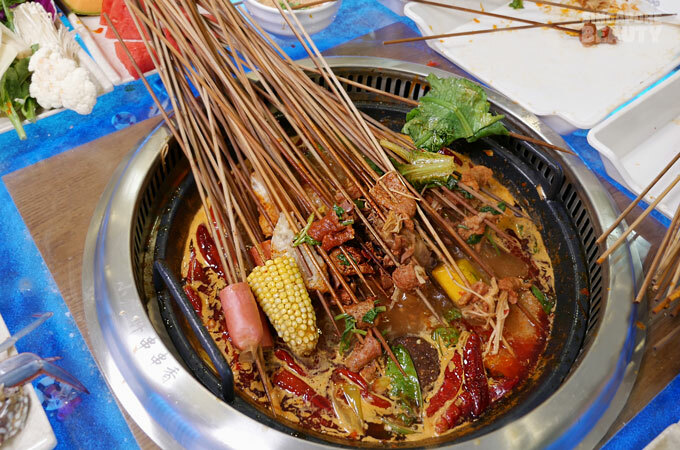 This sauce is a great dip for the hotpot skewered items as the oil helps to mellow down the heat. 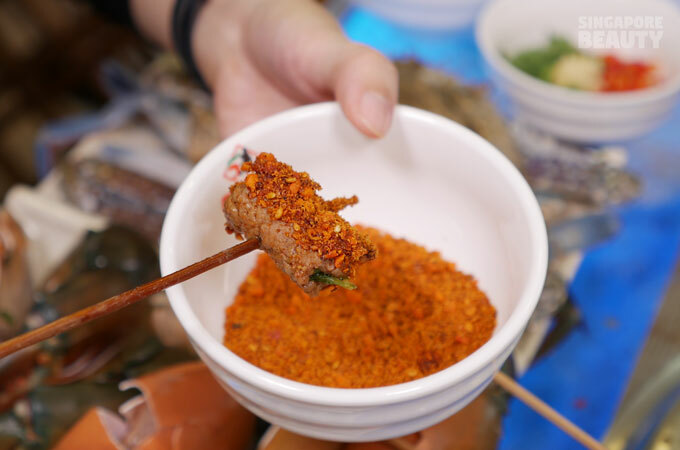 The other is the spices powder (干碟) to dip the skewered meats. This is special powder made of ground star anise, cinnamon, fennel seeds, cardamom, orange peels and many other spices and herbs. Do give it a try! Recommended. 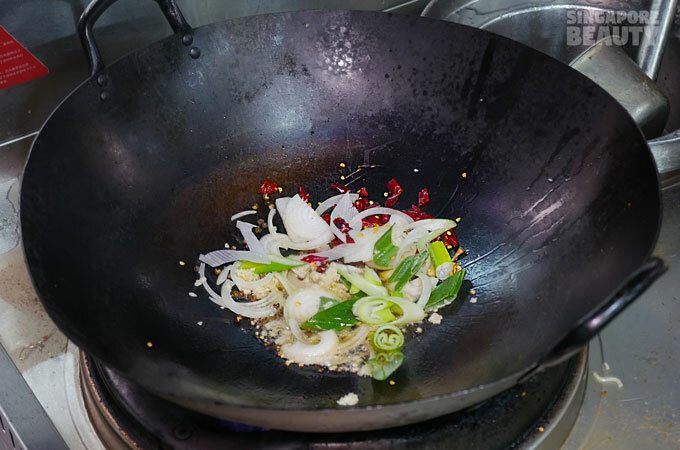 The third way of eating is with chilli flakes, peanut and sugar. This gives it a spicy, nutty and buttery texture to the meat. 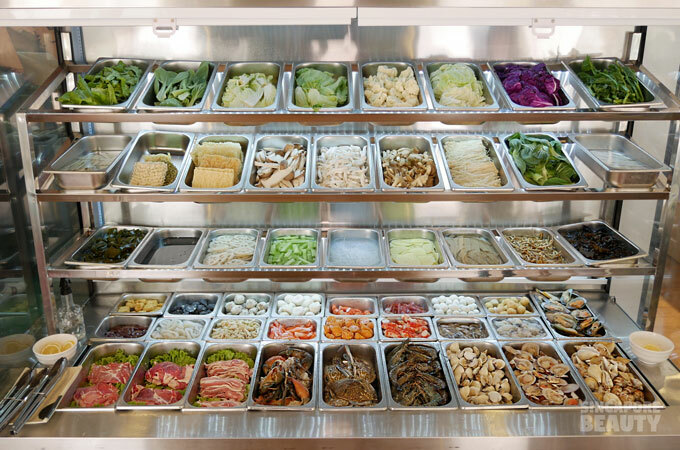 Besides the seafood and skewers, there is a good variety of fresh greens. These are butterhead, xiao bai cai, cabbage, lettuce, cauliflower, Australian cabbage, red cabbage, cai xin, enoki, oyster mushroom, straw mushroom, king mushrooms, fried beancurd skin, spinach noodle, spinach, vermicelli, lotus roots, potato, several types of egg noodles, kelp, seaweed and many more. 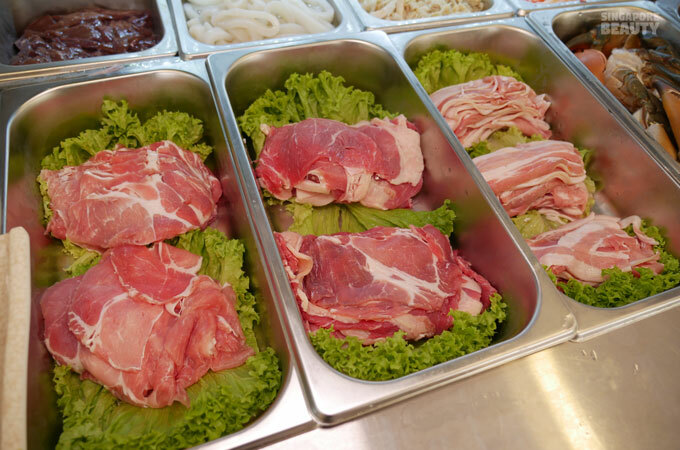 The shabu shabu meat available are pork, beef, beef tripe, mutton, pork liver, pork loin, pork shabu shabu meat, pork skin, quail eggs and bacon. 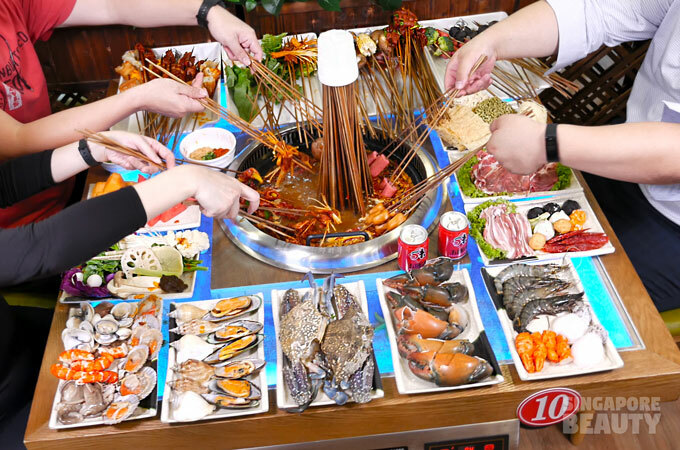 For surimi, there are cheese tofu, squid ink balls, sotong balls, mushroom balls, fish roe balls, chinese sausage, mock snow crab legs, mock lobster tails and many more. 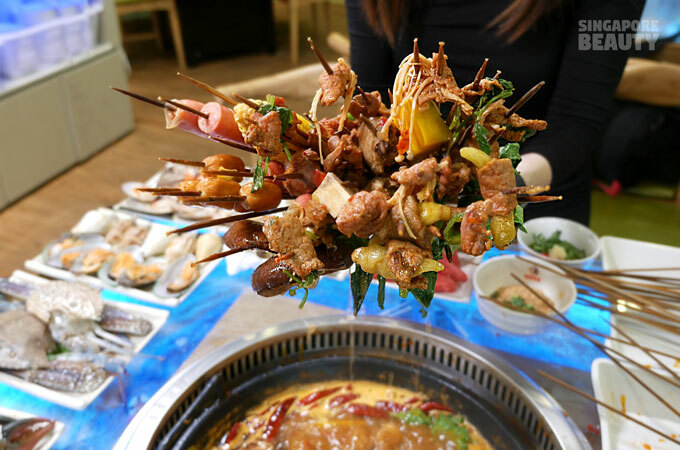 More than 50 types of skewers such as bitter gourd, pumpkin, xiao bai cai, shanghai green, okra, sweet corn, big cabbage, yam, pork skin, chinese sausage, tang oh, broccoli, cauliflower, lettuce, braised beancurd, fried beancurd skin, asparagus, kelp, winter melon, crab balls, seafood bean curd, pork ribs, tendons, mala chicken, marinated chicken heart, pickled chilli beef, enoki beef, mala beef, green pepper beef, marinated chicken feet, marinated chicken mid wings, pork intestines, fishballs, white radish, cuttlefish, seaweed chicken, seaweed, sliced lotus root, sliced potato, roasted sausage, crab sticks, ham sausage, signature xiao jun gan (marinated chicken liver),mala xiao jun gan (mala chicken liver), ginger beef, parsley beef, chinese donut, beef tendons and many more. 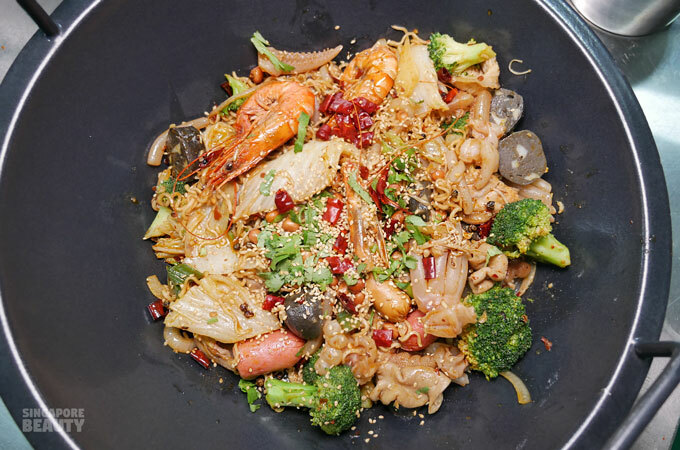 They also have ala-carte add on mala xiang guo, stir-fry fresh from scratch for each order. The mala xiang guo is charged by weight. 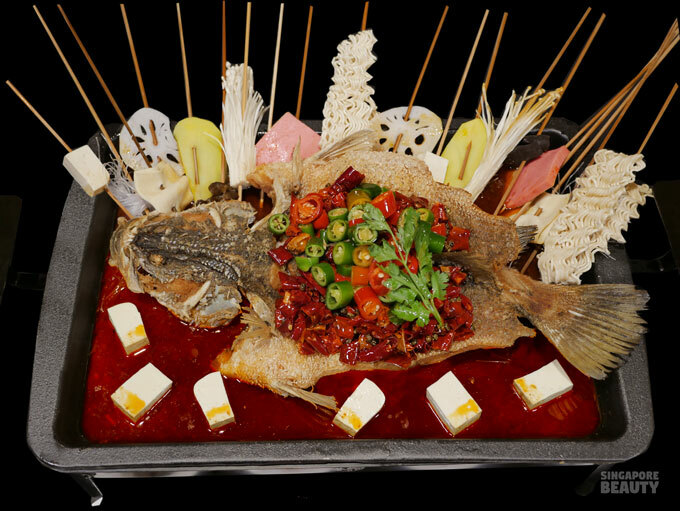 You can add-on (not included in buffet) a seafood mala xiang guo or a meat base malaxiang guo. 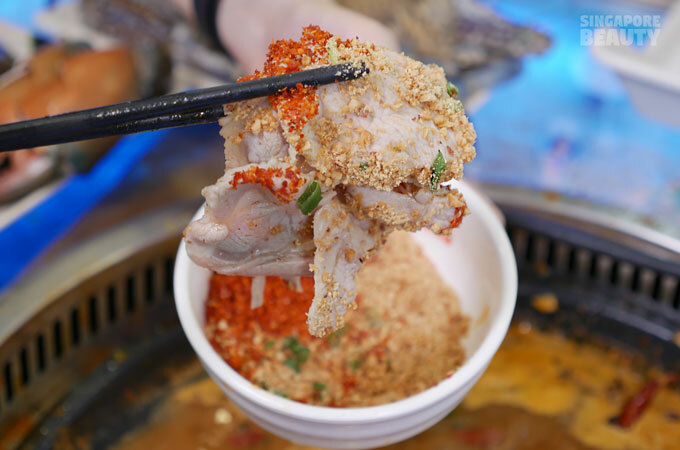 The mala xiang guo is not overly spicy, fragrant and suitable for young and old alike. This buffet is a bargain and one of the best deals in town as these skewers were previous ala-carte at 50 cents each, but now in this current buffet is free-flow. This restaurant is spacious, air conditioned and well ventilated. The tables are great for groups of 4 pax or more. Cushioned bench seating and outdoor seats are also available. 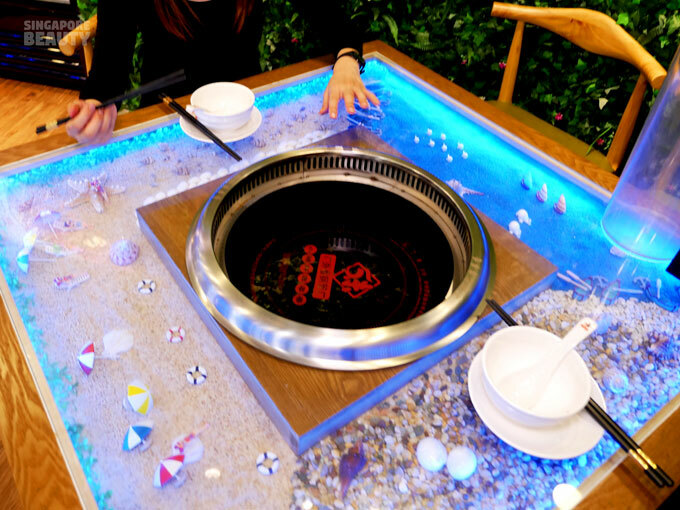 Comes with lit tables with interesting table top theme such as beach theme, picnic theme and many more. 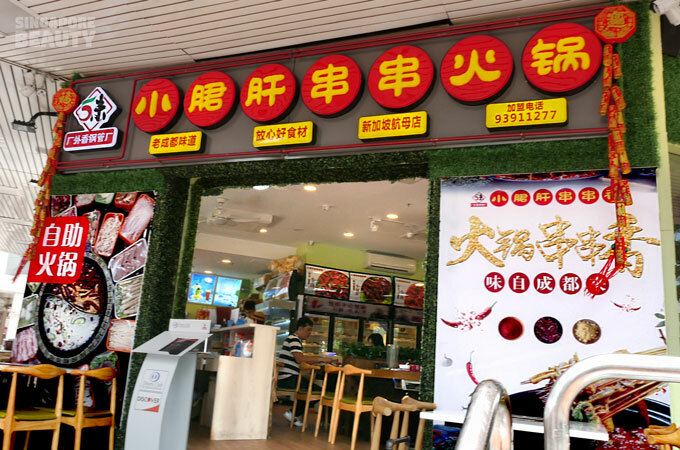 A brief introduction of Xiao Jun Gan Chuan Chuan Xiang 钢管厂小郡肝串串香五味缘- This is a popular chain store in many parts of China, Chengdu with over 1800 shops globally. 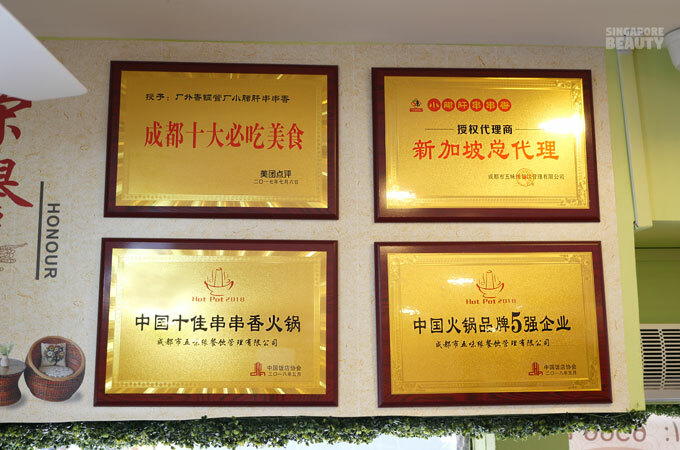 It is awarded the top ten must-eat food in Chengdu, China, the top five hotpot brands in China and top ten best chuan chuan fragrant hotpot in China as displayed atop the cashier counter in store. 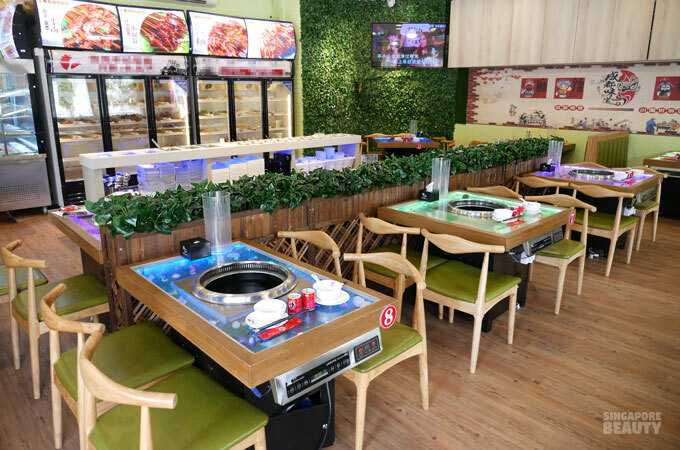 In Singapore, this branch is the second outlet, newly opened in December 2018 following the success of the first flagship store in Chinatown. Head over today for this buffet at the amazing price of $22.80+. 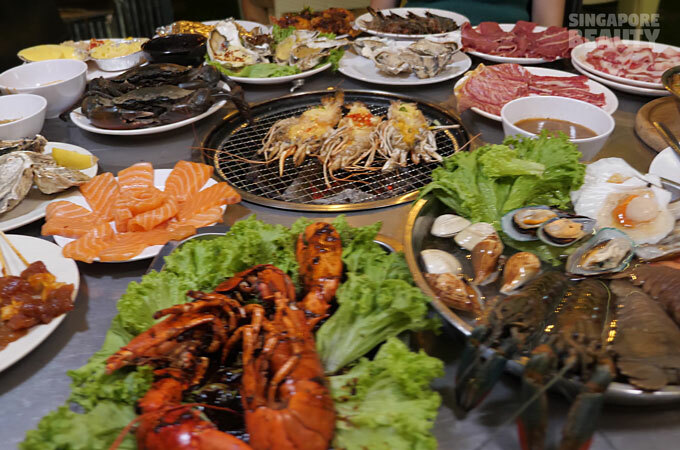 Unlimited lok lok, meats and seafood all-you-can-eat buffet all days includes PH too ( quote SingaporeBeauty) with unlimited dine-in time* at Xiao Jun Gan Chuan Chuan Xiang 钢管厂小郡肝串串香五味缘 located conveniently at Bugis. Unlimited dine-in time*- for peak hours the dine-in time will be 2 hrs, please call to check with the restaurant for their peak hours. The promotional price of $22.80+ all days included PH and weekends (quote SingaporeBeauty) starts from now till the 11th of April 2019. 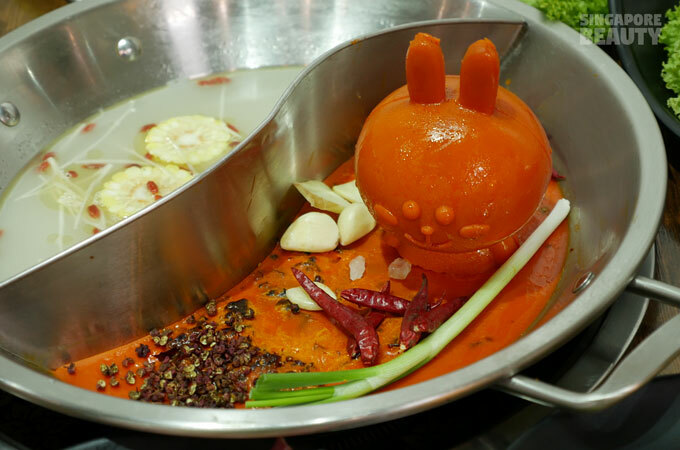 Hurry time to Chiong over to this Xiao Jun Gan Chuan Chuan Xiang 钢管厂小郡肝串串香五味缘buffet now ! 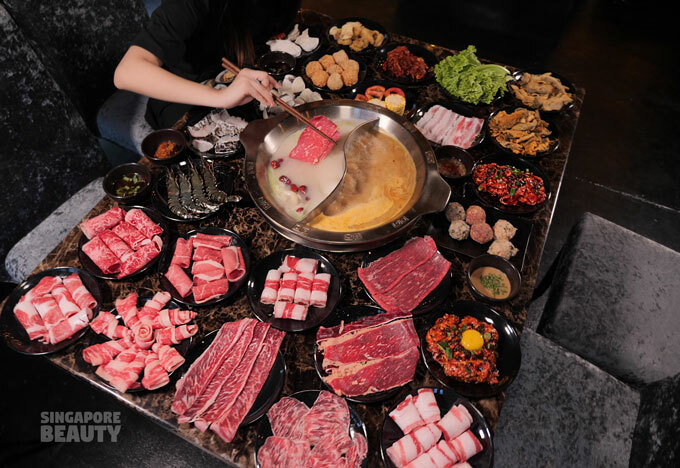 Soup is included in buffet, choice of 6 soup bases- signature Sichuan special mala, secret recipe clear broth, tomato, herbal, shanzhen mushroom, tom yum. You can choose either single or duo soup. You can also check out the other outlet at 274 South Bridge Road, S058823 or call 63272188. Do note that for this south bridge road outlet replaced mud crabs with handmade prawn paste on the buffet menu. Brought to you by Xiao Jun Gan.